Hi everyone! 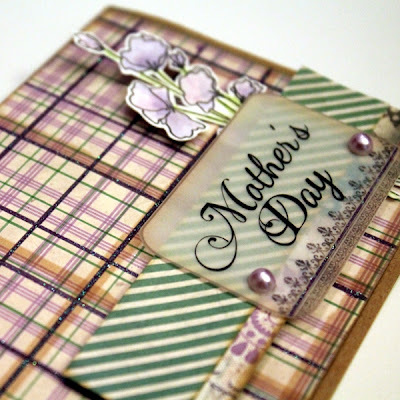 Wendy here and today I'm going to share a Mother's Day card featuring the new Dusty Road Collection. 1. Using a glue pen and ruler, add lines of glue following the pattern in the plaid paper. Sprinkle on glitter. Adhere pattern paper to card base. 2. Stamp image. Tap Powder Puff inks onto craft sheet and dilute with water. Paint flower. Cut out and adhere to card base. 3. Ink strips of pattern paper and adhere to card. 4. Trim quote from vellum strip. Add a line of glitter with adhesive. Adhere to card and pearls. Thanks so much for stopping on over today! Have a fabulous and relaxing Sunday! Don't forget - we have a Quick Quotes / Kiwi Lane Designs giveaway going on! Such an interesting card for Mother's Day. I really like the plaid and flower together. Fun card... Yes I still need to make a Mother's day card... thanks for the reminder. So pretty!! I love the flower stamp you used with this line!